True leadership is the most valuable commodity in the world- yet few really know how to attain it. This new edition of a much talked about executive and management self-development book offers a fresh approach to assessing and cultivating vital leadership skills in any organization. It is newly updated with creative self-assessment tools and an emphasis on leadership coaching and mentoring. It goes beyond the traditional to define the relationship between leadership performance and corporate performance optimization. Transforming Leadership introduces a new style of leadership-one that blends effective business practices with compassion and awareness-to help today's leaders develop and build what Anderson calls a "leadership organization" that will flourish in our ever-changing global marketplace. It shows you how to become a dynamic leader as well as prepares you to develop your colleagues' and employees leadership skills while you work with them. This is the kind of innovative, inside-out leadership that is sure to help any company meet the challenges that lie ahead.
" Transforming Leadership is a must read for anyone who wants to make a difference in the future." " You don't just buy this book, read it and put it on the shelf. 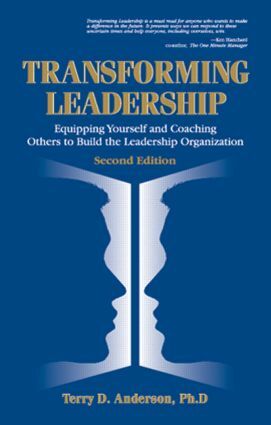 Transforming Leadership is a book to use and re-use and re-use." "This book provides the individual manager, consultant, counselor, human resource executive, leadership team and enterprise a clear insight into the distinct elements that cultivate leadership … For anyone eager and serious about developing leadership, Transforming Leadership is an absolute must."